This image, taken early April 10, 2010 by the NASA-ESA SOHO sun observatory, shows a newfound comet just before it is annihilated by the sun. Here, the comet is extremely bright as seen by SOHO. Shortly afterward, it dims noticeably and later disappears entirely. Full story. 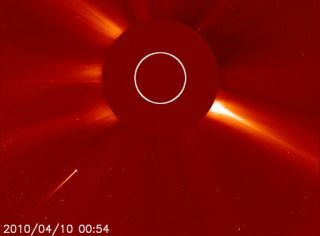 The destruction of a comet as it approached the sun was caught on camera Saturday by a long-lived space observatory. Thecomet, a stranger to astronomers, is now doomed to anonymous obscurity. The comet?s death plunge was recorded by the sun-watchingSolar and Heliospheric Observatory (SOHO) as the previously unknown icywanderer barreled down on the sun from cosmic parts unknown, according toSpaceweather.com, a Web site dedicated to monitoring space weather. The comet appeared in SOHO images on Friday but by early thismorning it had disappeared entirely, Spaceweather.com reported. This is the thirdcomet to swing by the sun this year. Known as sun-grazing comets, the icyobjects most likely come from the outer solar system, though it is unlikelythat any survive their encounters with the sun. The doomed comet spotted by SOHO this week, as well asthe others seen this year, may be part of group of objects called Kreutz comets? named after the 19th century German astronomer Heinrich Kreutz. It was Kreutz who first demonstrated that such cometswere related, and may the shattered remains of a single, giant comet that brokeaboard several centuries ago [morecomet photos]. Astronomers estimate that there may be more than 1,600comets in our solar system that swing through its heart to pass by the sunduring their travels. As of 2000, the definitive count for sun-grazingcomets passed the 1,000 mark. The SOHO spacecraft is in a prime position to catchsun-grazing comets as they swing by or are devoured by the sun. The mission isa joint effort by NASA and the European Space Agency. SOHO uses a center-mounted disk to block the blindingglare of the sun in order to observe solar flares, coronal mass ejections andother weather, as well as objects near the sun. It has been instrumental infinding sun-grazing comets since it began studying the sun in 1995. Prior to the SOHOmission, astronomers had found only 16 sun-grazing comets using space-basedtelescopes, NASA officials have said.